Weddings one of the most well attended occasions that I know of. It’s always different when you are attending someone’s wedding especially if it so solemn and sacred. For most couples their union is sealed by a priest or minister during wedding ceremony. These days church is the only place where couples wanted to give their vows to each other. Beach or garden weddings are commonly chosen by couples but no matter what destination weddings who choose as long as you will be united as one in the eyes of the Lord. Planning a wedding can be a headache since there are many things to consider, the place, food, invitations and lots more and sometimes too much to handle by the couple that sometimes they seek help though a wedding planner or with their relatives/friends. I reckon after the stress and sleepless nights preparing for the BIG DAY, the couple should enjoy themselves in a great honeymoon escapades. 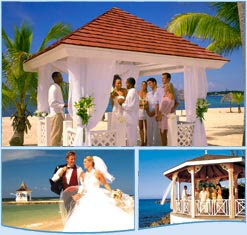 There are many honeymoon all inclusive resort packages from Super Club where couples can pay particular attention to. The most popular are the discount vacation packages for the couples since they can save more. I remember watching a beach wedding in a TV show and oh boy it was magical and memorable.